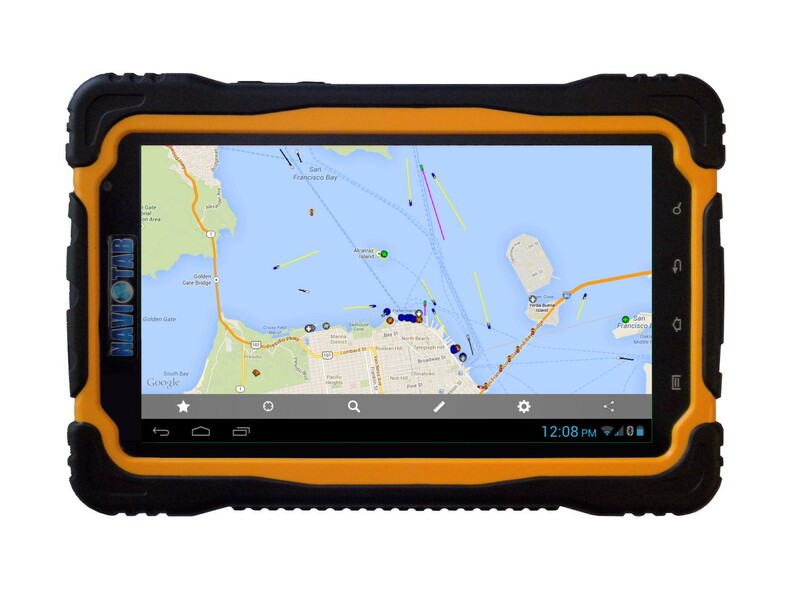 NAVIOTAB+ will be equipped with the fantastically accurate BoatBeacon AIS radar app. Specifically designed for use on the water, uniquely providing Bearing, Range and Closest Point of Approach (CPA) calculations in addition to all the standard AIS information. Uses up to the second AIS feeds unlike the other AIS apps which can be a minute or even more behind real time. Transmits as well as receives AIS and the only app that continuously monitors CPA, notifying if potential collisions are detected even when the app is in the background. A cellular Internet data connection is required to use boat beacon either through NAVIOTAB+ SIM card, or via a WiFi hotspot on your phone. No external antenna is required. The AIS app communicates with the AIS network via the cellular data or WiFi connection. AIS transponders automatically broadcast information, such as their position, speed, and navigational status, at regular intervals via a VHF transmitter built into the transponder. The information originates from the ship’s navigational sensors, typically its global navigation satellite system (GNSS) receiver and gyrocompass. Other information, such as the vessel name and VHF call sign, is programmed when installing the equipment and is also transmitted regularly. The signals are received by AIS transponders fitted on other ships or on land based systems, such as VTS systems. The received information can be displayed on a screen or chart plotter, showing the other vessels’ positions in much the same manner as a radar display. Data is transmitted via a tracking system which makes use of a Self-Organized Time Division Multiple Access (SOTDMA) datalink designed by Swedish inventor Håkan Lans. The AIS standard comprises several substandards called “types” that specify individual product types. The specification for each product type provides a detailed technical specification which ensures the overall integrity of the global AIS system within which all the product types must operate. AIS was developed as a technology to avoid collisions among large vessels at sea that are not within range of shore-based systems. The technology identifies every vessel individually, along with its specific position and movements, enabling a virtual picture to be created in real time. The AIS standards include a variety of automatic calculations based on these position reports such as Closest Point of Approach (CPA) and collision alarms. As AIS is not used by all vessels, AIS is usually used in conjunction with radar. When a ship is navigating at sea, information about the movement and identity of other ships in the vicinity is critical for navigators to make decisions to avoid collision with other ships and dangers (shoal or rocks). Visual observation (e.g., unaided, binoculars, and night vision), audio exchanges (e.g., whistle, horns, and VHF radio), and radar or Automatic Radar Plotting Aid are historically used for this purpose. These preventative mechanisms, however, sometimes fail due to time delays, radar limitations, miscalculations, and display malfunctions and can result in a collision. While requirements of AIS are to display only very basic text information, the data obtained can be integrated with a graphical electronic chart or a radar display, providing consolidated navigational information on a single display. This entry was posted in Announcements, Tech notes. Bookmark the permalink.